Some real ideas from a real American! Bye-bye NWO! Rand Paul has a penchant for making trouble for government establishments he feels are in violation of the constitution. He’s made a career on challenging the establishment and has constantly been a thorn in the government’s side. And while the IRS isn’t technically a government organization, don’t think Paul’s going to let them off the hook for over-stepping their authority. 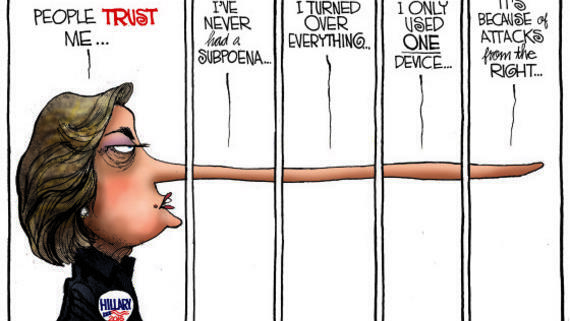 In fact, Paul has just filed a lawsuit against the IRS. One of the first of its kinds. “Republican presidential candidate Rand Paul sued the Treasury Department and Internal Revenue Service over rules on how Americans abroad are taxed and what foreign banks must disclose about U.S. customers. The Foreign Account Tax Compliance Act is supposed to make it harder to hide assets overseas, yet its regulations are unconstitutional and violate privacy rights of U.S. citizens, Paul said in the complaint. The suit, filed Tuesday in federal court in Dayton, Ohio, also seeks to strike down requirements for Americans to file reports on foreign accounts over $10,000. The tax act, or Fatca, “imposes enormous economic costs on individuals and financial institutions,” according to the suit by the U.S. senator from Kentucky and six others. It makes millions of Americans living abroad report accounts above $50,000 with their annual tax returns. Fatca also requires foreign banks to report any account held by a U.S. taxpayers. Justice Department representatives didn’t immediately respond to an e-mail after regular business hours seeking comment on the lawsuit. President Barack Obama signed the law in 2010, and the Treasury Department reached cross-border agreements that are easier for governments and banks to use than the strict rules in the law itself. Those accords, which didn’t get congressional approval, are unconstitutional because they exceed the president’s authority, Paul claims. He asked a judge to strike down the Canadian, Czech, Israeli and Swiss agreements. Paul, a frequent critic of the IRS, is blocking Senate ratification of a U.S.-Swiss tax treaty signed in 2009. The lawsuit also targets the Treasury requirement that U.S. residents abroad disclose accounts through a Report of Foreign Bank and Financial Accounts, or FBAR. Americans who willfully violate the law are subject to penalties of 50 percent of the high balance of the account — a levy that can run into the millions of dollars. Paul claims the penalties under both the FBAR provision and Fatca violate constitutional protections against excessive fines. The lead lawyer on the case is James Bopp Jr., a longtime conservative activist whose clients have included the Republican National Committee. Fatca requires U.S. financial institutions to impose a 30 percent withholding tax on payments made to foreign banks that don’t agree to identify and provide information on U.S. account holders. It allows the U.S. to scoop up data from more than 77,000 institutions and 80 governments about its citizens’ overseas financial activities. The case is Crawford v. U.S. Department of Treasury, 15-cv-00250, U.S. District Court, Southern District of Ohio (Dayton)”. Admittedly a lawsuit against the IRS probably won’t do much. Even when they’re caught with their hands in the proverbial cookie jar all that ever happens is they receive a minor slap in the wrist. The encouraging thing in all of this is seeing Paul, a Presidential candidate, refusing to let the government continue to grow in scope. These are the hallmarks of a willing and committed libertarian, and we can be sure if Paul were elected he would use his executive authority to shrink the size and scope of governmental authority. Over the weekend, “the Donald” backed down on his attacks on McCain, calling “Hanoi John” a “war hero.” However, Donald is not going to be able to close the can of worms he opened. Today, McCain is trying to wrap himself in the POW flag for cover. POWs had never been rock star heroes before, quite the opposite. These are people who surrendered to the enemy, people suspected of collaboration and worse. With Korea, POWs became the shame of America with many “brainwashed” into following communist doctrines. American POWs from Vietnam were the bloody flag Richard Nixon wrapped himself in, on the advice of Henry Kissinger, part of a ploy to divert attention from his endless personal failings which included his agreement with North Vietnam that let them keep and later execute hundreds of American POWs. 1205 American POWs were kept by North Vietnam according to records recovered at the end of the Cold War. President’s Clinton and Yeltsin instituted a search of Russia’s gulags looking for their remains with no success. In 1993, armed with testimony from a former high ranking Czech security official, I proposed a systematic search of archives in Prague that recorded the fate of 200 missing US POWs from Vietnam but was blocked by Senator John McCain. 33 POWs faced execution for treason after Vietnam until Nixon pardoned all POWs. McCain was on the list of the 33, in fact at the head of it. According to Colonel Ted Guy, John McCain’s commander as a POW, McCain collaborated with the enemy. McCain is accused of making over 30 propaganda broadcasts against the US, broadcasts he moved to have classified when he was elected to the senate. These 4 accusations are the only real and supportable accusations against McCain. The evidence for these acts exists and is substantial. What is stranger still ………snip………. 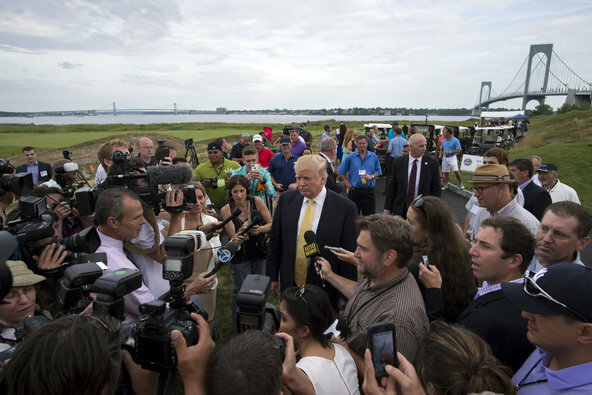 Donald J. Trump spoke with members of the media at the Trump Golf Links in the Bronx on Monday.Credit Karsten Moran for The New York Times. Donald J. Trump, the real estate mogul who has tied Republicans in knots in recent weeks with his comments on immigration, will roll into Phoenix on Saturday to address the issue again, just after the head of the Republican Party supposedly asked him to tone down his words on the issue. The planned speech is already attracting a storm of attention. Even as city leaders have asked (emphasis added by me ) Mr. Trump “to stage his hate-filled circus” elsewhere, ticket requests have been so high the campaign has moved the speech from the swank Arizona Biltmore hotel to the convention center downtown. Mayor Greg Stanton, also a Democrat, issued a similar statement condemning Mr. Trump and his remarks, but assured that the city would not try to prevent the candidate from speaking. Mr. Trump’s spokeswoman, Hope Hicks, said on Friday that 4,500 tickets had already been reserved for the speech, 3,500 more than initially expected. Mr. Trump will appear onstage with Joe Arpaio, the long-serving sheriff of surrounding Maricopa County, whose tactics to track down and deport illegal immigrants have drawn national attention and a federal conviction for racial profiling in 2013. Mr. Trump has attracted sharp criticism from business and political leaders since asserting in his campaign announcement that those crossing the United States-Mexico border illegally include rapists and criminals. The remarks led several businesses, including Macy’s, Univision and NBC, to cut their ties with the developer. Republicans will be watching the weekend swing through the desert closely to see if Mr. Trump tempers his language on the issue. This week, Reince Priebus, the chairman of the Republican National Committee, was said to have urged Mr. Trump in a phone call on Wednesday to soften his tone on immigration. Mr. Trump is expected to start the day on Saturday in Las Vegas, where he will speak at FreedomFest, an annual libertarian-leaning gathering that bills itself as the “world’s largest gathering of free minds.” Ms. Hicks said he will also hold a press conference after the event. CRITICAL: Major Global De leveraging Occurring NOW! NYSE Trading HALTED. Why does the main stream media downplay Donald Trump? The main stream media has been told to tell lies and they are gladly doing so. They have been told who to push for the next president. The next president has already been “elected”, it is the job of the media to convince the American public to go along with that particular choice. The data does include immigration violations, of which illegal immigrants represented by far the greatest number of cases: 91.6 percent, or (20,333 cases), out of a total 22,204 cases. Eliminating all immigration violations, illegal immigrants would account for 13.2 percent of all the offenders sentenced in FY14 following federal criminal convictions — still greater than the 3.5 percent of the population illegal immigrants are said to make up.